How much does it cost to travel to Bangalore? How much money will you need in Bangalore? ₨1,869 ($27) is the average daily price for traveling in Bangalore. The average price of food for one day is ₨361 ($5.20). The average price of a hotel for a couple is ₨2,264 ($33). Additional pricing is in the table below. These average travel prices have been collected from other travelers to help you plan your own travel budget. How much money do I need for Bangalore? 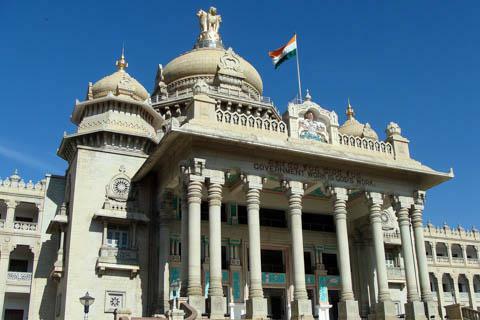 Bangalore is the capital city of the state of Karnataka, in India. It's also India's third largest city with a population of about 8.5 million. It's considered one of the most liveable cities in the country and was historically known for its many gardens and lush green spaces. Today those areas are all but gone, having given way to the growing population and sprawling metropolises. Bangalore is also the information technology hub of the country and is sometimes referred to as India's Silicon Valley. Bangalore has a tropical savanna climate with separate wet and dry seasons. The city sits at an elevation of about 900 meters above sea level, giving it a moderate climate throughout the year. Heat waves may make temperatures uncomfortably hot during the summer months. December is the coolest month with lows around 60 degrees Fahrenheit. April is the hottest month with highs approaching 100 degrees Fahrenheit. Bangalore is effected by both the northeast and southwest monsoons, with the wettest months being September, October, and August. Bangalore is not a popular tourist destination in India, but many foreigners find themselves in town on business. There is plenty to see in town if you end up here and have a few days to explore. If you're short on time, consider taking a tour which will show you the highlights in a fast and efficient manner. Most of the entry fees for attractions are not included in the price of the tour so it is best to confirm what is and isn't included ahead of time to ensure you have enough cash on you and there are no unexpected surprises. Popular sights and landmarks around town include Vidhana Soudha, Vikasa Soudha, Bengaluru Palace, the Bull Temple, the Maha Bodhi Society Temple, and Gavi Gangadeshwara Cave Temple among many others. Most of Bangalore's neighborhoods, or "colonies", have a mix of the old and the new. The city is laid out in a rough circle, with the oldest areas closer to the center. Malleswaram is in the northwest part of the city and is very historic. It's a very green neighborhood that is very walkable with food vendors and good sidewalks. It's also a very pleasant neighborhood with old world charm and many religious centers and schools. Indiranagar is near the center of the city and has one of the older residential areas. It's also a major shopping area with many restaurants and pubs. Koramangala is also close to the city center and has many newer shopping malls. BTM Layout is where many of the IT employees live. Marathahalli has residential areas, IT offices, and apartment buildings. Jayanagar has wide, tree lined avenues and is close to Lalbagh Botanical Garden. One fun activity in Bangalore is to go and watch a cricket match. Chinnaswamy Stadium hosts the local Indian Premier League (IPL) team, the Royal Challengers. Games take place in the evenings and typically last about three hours. Concerts and shows can be seen at Bangalore Palace Grounds, Rangashankara, and Jagriti Theater. There are several lakes in Bangalore worth visiting. Both Ulsoor Lake and Sankey Tank make pleasant trips. There is no end to the restaurant options in Bangalore. There are many fast food style restaurants that serve up quick and cheap meals. Most have South Indian vegetarian food including dosas, idlis, vadas, curd rice, pulao, rice with Sambar, and lemon rice. Patrons of the restaurants either sit at the small round steel tables or stand in the remaining space between the tables. There are also plenty of mid range and high end restaurants. Bangalore is not that close to the sea, so while you'll find seafood available at many restaurants, it is best avoided as the quality can vary dramatically. The bus system within Bangalore is quite good and cheap, but many visitors prefer to rely on taxis or rickshaws to take them places. Like elsewhere in India, negotiating a price is critical, and you should expect to pay a small fraction of the original asking price. Barter hard or you will be ripped off. There is a new metro system known as "Namma Metro". The first stages of the system opened in 2014 and plans are in place to complete the project by the end of 2015.